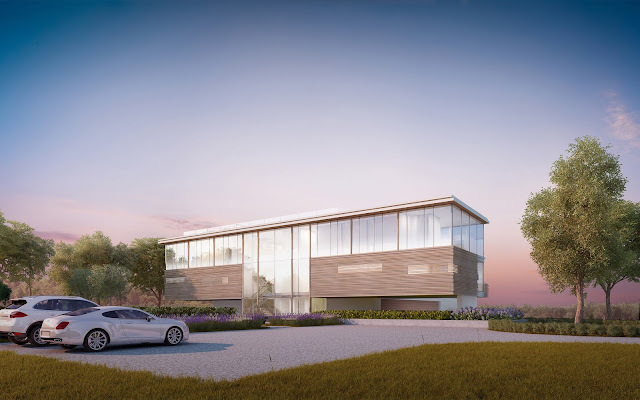 Andre Kikoski, renowned for his work at the Guggenheim Museum, announced his newest project, a contemporary oceanfront home for Hamptons real estate magnate Jay Bialsky. 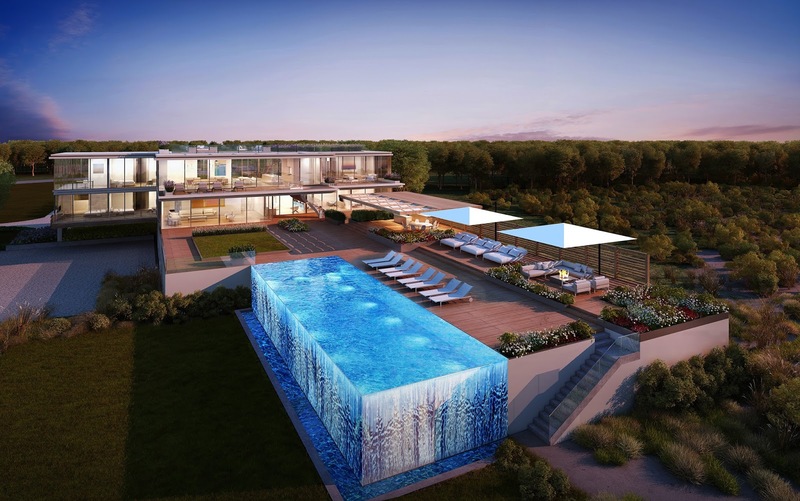 Bialsky has built some of the most exceptional homes seen on Long Island’s East End for some of the Hamptons’ most discerning clientele. 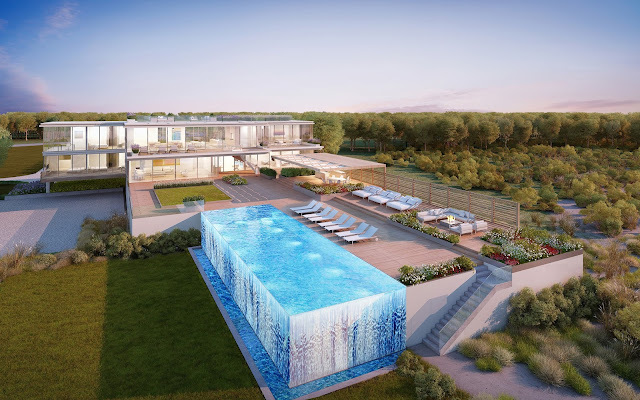 He turned to AIA Institute Honor Award-winning architect Kikoski for a residence that celebrates the stunning natural landscape, storied beauty, and expansive ocean views that are the best of the Hamptons. 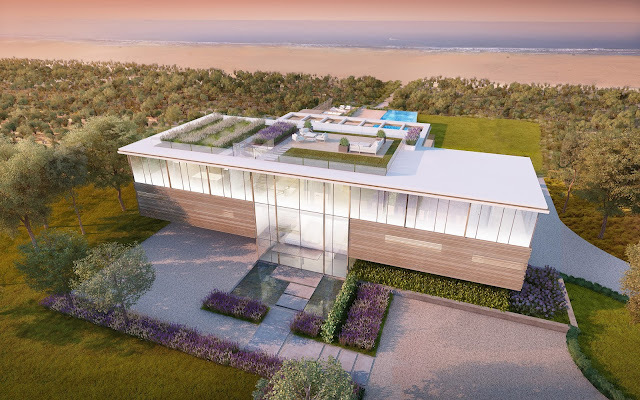 "We wanted to create harmony among house, land and sea, something that took advantage of this unique oceanfront positioning, a contemporary design where you can almost feel the sand beneath your feet from any spot in the house," said Kikoski. "We’ve worked on NYC trophy penthouses where it was all about the views, but this home really takes the cake." With an outstanding oceanfront location and deeded ocean access to a private section of Bridgehampton’s sought after beaches, this state-of-the-art home takes the indoor/outdoor living concept to the next level, with 10,000SF +/- of interior space complemented by over 12,000SF +/- of exterior space. The expansive exterior space features multiple outdoor living areas including a covered kitchen and dining area, rooftop deck with landscaping/garden, numerous outdoor lounges, custom infinity-edge pool, fire pit and outdoor shower. 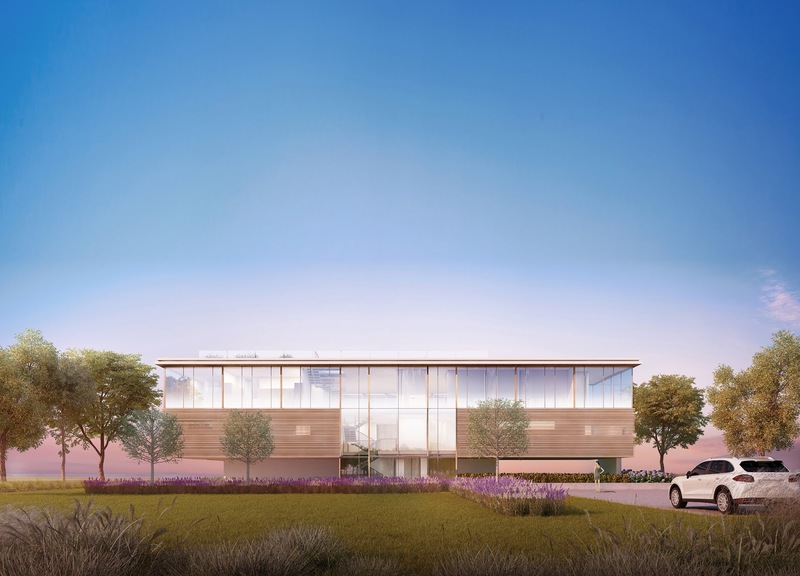 The combined 22,000 SF+/- of interior and exterior living space is afforded by the properties large and optimal building envelope being set in an AE Zone, which is rarely found in oceanfront properties. The superb location is captured by entire walls of glass that provide sweeping panoramic views of the Atlantic Ocean from nearly every room in the house, while sunset vistas over stunning Mecox Bay can be enjoyed from the rooftop deck. With a keen eye for any parcel's maximum potential, Bialsky is responsible for some of the most magnificent homes and developments on the East End, many of which have unparalleled views. Bialsky's exacting standards keep his homes in constant demand, "I don't buy any property or build any home I wouldn't want to live in myself," he says. The property is listed for $44.9M with Zachary and Cody Vichinsky of Bespoke Real Estate. 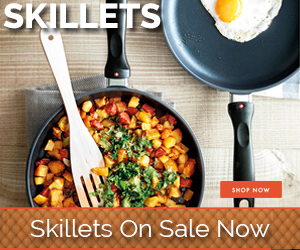 Bespoke is a Hamptons based firm that only represents $10M and above properties . Kikoski is currently working on 75 Kenmare, a 90,000 SF residential development which recently broke ground in Nolita, with DHA Capital and the Kravitz Design Group. He is also the interior architect on the 325,000 SF tower by the Related Companies slated to open this summer at Hudson Yards. And AKA launched a line of home accessories with Swarovski Crystal at Salone de Mobile in Milan, Italy last April. 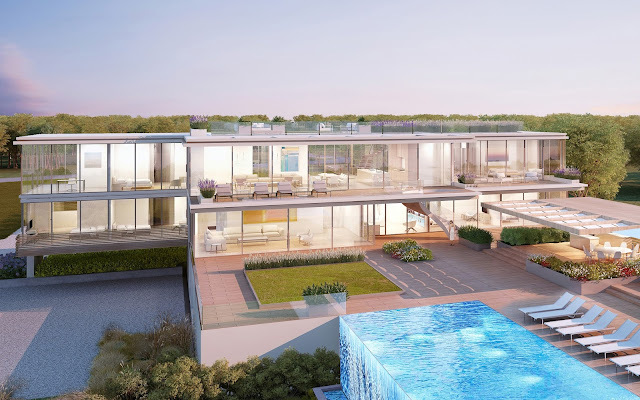 The design blends 10,000 square feet of interior living space over two levels with an equal area outside -- spread between three floors of invitingly landscaped decks and terraces. Interior and exterior lie side by side, gently joined together by 60-foot long expanses of automated structural sliding glass panels that disappear into exterior walls. The open-plan living and entertaining spaces, as well as the master suite, enjoy magnificent direct views of the Atlantic Ocean, Mecox Bay and the landscape beyond in every direction from the second level. A triple height glass atrium organizes vertical circulation within the house, filling the interior with the fabled natural light of the Hamptons at every moment of the day. A folded metal plate staircase connects this level to a spectacular rooftop entertaining garden. Equally bold is the focal point of the first level – an expansive outdoor deck, poised above the grassy dunes and offering direct ocean views from the trellised open-air dining pavilion, bar and kitchen, as well as a fire pit with seating area and multiple landscaped lounging areas. The spectacular oceanfront infinity edge pool and spa, unique in being just steps from the beach, is however the centerpiece and star. These dramatic exterior spaces flow into informal indoor entertaining rooms, including a generous family room and high tech home theatre which also feature automated structural sliding glass wall panels. Six additional bedrooms, a home office, wine cellar, sauna, and six car garage round out the program. The residence is set amidst one and a half expertly landscaped acres with ample manicured lawns designed by award-winning landscape architect Edmund Hollander. In addition to elegantly composed glass facades, with playfully proportioned window patterns, the exterior of the house is clad in simple honest materials such as cerused stucco and a randomly staggered horizontal screen of three different sizes of Brazilian Ipe wood components. The screen is inspired by Kikoski’s prior collaboration with artist Liam Gillick for a site-specific installation, and complements the clean lines of the exterior with an inviting dappling of shade and shadow. Andre Kikoski, renowned for his work at the Guggenheim Museum, is an award-winning Manhattan-based architect, with more than 100 completed projects. His firm AKA has been featured in more than 700 publications across 27 countries, and has won over 30 design awards for interior design, architecture and product design. Andre is a Trustee of the Van Alen Institute and Alumni Council Emeritus at the Harvard University Graduate School of Design.